I have been debating the gender issues in the perception of books for a while now, and I have finally made a decision. I will use Joanna Penn for my non-fiction and other works I have in the pipeline. Why am I doing this? Pentecost and Prophecy have some pretty violent scenes. I burn a nun to death on the funeral pyres of Varanasi and disembowel a psychiatric patient in the first few chapters. It's not horror but it is thriller with a high body count and I make no apologies for that. I like action movies. I like Lee Child's Jack Reacher. I love James Bond. In fact, one day, I'd like to be the first female writer to pen a Bond novel – move over Jeffrey Deaver! But apparently it's worthy of comment when a woman writes this type of thing. 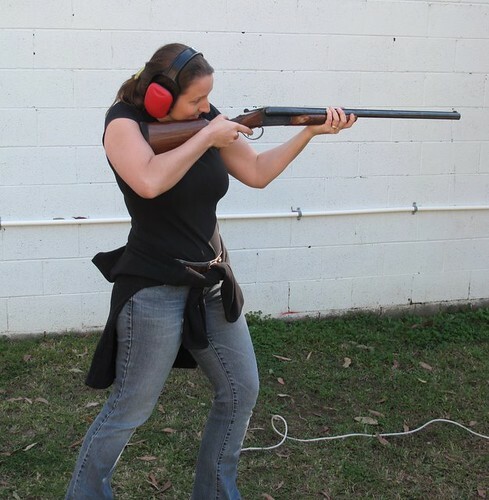 Thriller novelists need to know how to shoot! I don't mind being compared to a man. It doesn't offend me. In fact, I find it kind of liberating. But I don't want any consideration of my gender to come up when someone reads my books. I want them to have a great fun read and escape the world for a time. So if changing my name to initials stops any second thoughts, then it's worth it. I'm excited as this is a category I like to rank in. I also rank consistently in Religious Fiction which is a more varied category. Action Adventure is certainly male dominated. Stieg Larsson, George R.R. Martin, John Locke, Steve Berry, Clive Cussler, Lee Goldberg, Tom Anthony, J.A. Konrath… these are the names from the Top 20 as I read them right now. There are a few scattered female names but it's an overwhelmingly male group. I don't know whether there are more male readers in this category. I certainly buy these authors but I don't think women readers are that hung up on the gender of the author. But apparently men are and they are less likely to buy from a female name. Feel free to say otherwise, male blog readers! Men also get more attention and reviews. But I won't be changing my gender, for now at least! A number of women writers of successful women writers use initials. The reader doesn't know who they are until they look behind the curtain which, I think, is how it should be. Baroness P.D. James, whose honours come from services to literature and who is still putting books out aged 92. ‘Children of Men' seriously rocked. J.K. Rowling. A woman in a man's fantasy world. Using a male name is an option. A now-famous example in the blogging world is James Chartrand who came out as a woman on Copyblogger.com after years of writing as a man. Her business is ‘Men With Pens‘ and writing as a man totally changed her business. I'll be interviewing James on the podcast and we'll discuss this further. The author doesn't matter. The reader matters. The author's gender shouldn't impact the way the story is read so it's best to make it a non-issue. Initials are neutral. They have no gender bias and I like that approach. I know there will be some people who disagree. But I do consider myself a feminist in the truly inclusive sense of the word. Men and women are different but equal and we should all have the same opportunities. I want to be a bestselling, name brand author. This will clearly take some time but I don't want my gender to be an issue either way as I write the books I want to write. What do you think about gender in publishing? Are initials acceptable for women to write under? Are male buyers influenced by a female author name? Hi Joanna – I’m debating whether to use initials for my thriller fiction books or a shortened first name – would this be considered a pen name? eg Cas Cat Cara etc – I was under the impression we couldn’t use a photo of ourselves if we use a pen name but many authors do so is this okay? You can be completely ‘out’ about your pen name – as I am with J.F.Penn, and use your pic etc – or you can keep it a secret. Whatever suits you. There are no rules 🙂 Just make sure there aren’t other books using that name on Amazon and that you can get the URL.